The large diameter high density polyethylene profile wall pipe for sewer, drainage, water supply, mining, industrial effluent, chemical storage & treatment applications. HDPE PIPES as IS: 4984 upto 110mm OD in PN4 & PN6 (manufactured on world renowned machine) for potable water supply, Industrial uses including conveying Acids, Alkalies and other Chemicals, Cable Ducting, Gas Distribution and other applications. 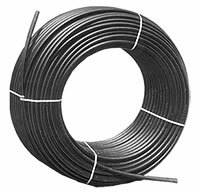 Available in lengths as per customers’ requirements in coils upto 300 meters and desired straight lengths. Copyright © 2019 kunststoffeindia Industries Ltd.. Powered by WordPress. Theme: Spacious by ThemeGrill.